We’re only two weeks into the new year, and already, 2008 is shaping up to be a big one for photo printers. Last week, Epson unveiled the Stylus Photo R1900, a B-size (13” by 19”) photo printer optimized for glossy output. Today, Hewlett-Packard is announcing the Photosmart Pro B8850, a B-size printer similarly designed for the advanced amateur photographer, and priced at $549. The B8850 uses eight pigment-based inks, including separate black inks for photo and matte-finish papers; a gray ink for printing improved black-and-white photos; and the standard set of cyan, magenta, light cyan, light magenta and yellow inks found in most midrange to high-end photo printers. It has a bottom-feed paper tray that can handle approximately 50 sheets of standard photo paper, and a manual feed tray for handling rigid media types up to 0.7 mm thick. It has a USB 2.0 port on the back, and LED status lights for each cartridge that turn on when the ink level dips below a certain percentage. The printer can handle paper sizes from 3.5" by 5" index cards all the way up to 13" by 44" panoramas, and can print on a wide variety of paper stocks. It has a built-in densitometer that ensures that the printer is properly calibrated when you first set the unit up, or when you change inks or printheads. It comes with a full complement of software, including an ink-status widget for Dashboard, a slick custom printing plug-in for Photoshop CS2, and even tighter integration with Photoshop CS3. It also includes HP’s advanced print driver option, which lets you add new paper types to the driver on the fly, associating the proper ICC profile with the paper, and making it available as a choice in the Print dialog box. 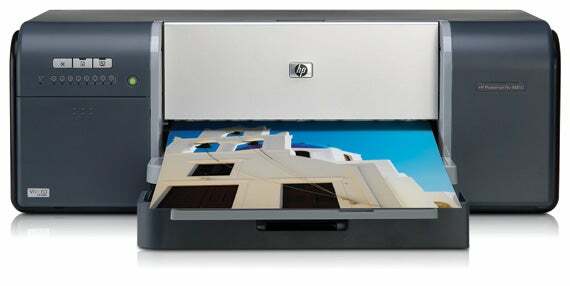 HP has designed the B8850 as the little brother to the $700 Photosmart Pro B9180 ( ). The B9180 was HP’s first real foray into the “advanced” photo market when it shipped in 2006, and over the past two years, the printer has done quite a bit to bring HP back into the semi-pro and professional end of the photo printer market. Looking at the B9180 and the B8850 side-by-side, you’ll notice immediately that they’re essentially the same printer. The B9180 has a status LCD in place of the B8850’s LEDs, and the printers use slightly different color schemes in their housing, but HP clearly wants to play up the similarities between the two. In fact, they even use the same cartridges and printheads, and they use the same closed-loop calibration system for color consistency. The B8850 lacks the B9180’s Ethernet port, so you can’t just plug it into a network, although Mac OS X’s printer sharing, as well as the USB port on Apple’s Airport base stations, should work fine with the B8850. The B9180’s 1.5-mm thickness limit (with the manual-feed specialty media tray) is twice that of the B8850. What this means is that many higher-end card stocks and fine-art papers can’t be used with the B8850, but HP and most third-party paper vendors are offering thinner versions of their fine-art papers. The B9180’s LCD status display lets you perform calibration and other maintenance tasks directly from the printer, while you must use software to access the B8850’s maintenance functions. HP plans to continue to sell the B9180 at its $700 price point. However, we’ve regularly seen it priced in the $600 to $650 range from certain photo vendors (it’s available through Jan. 31 with a $70 mail-in rebate from the HP online store), and ultimately, the B8850 should dip below $500 in many high-volume stores. Slated to ship at the beginning of April, we think the B8850 will be a quick seller. It has a proven ink set, black-and-white printing capabilities, and very good paper handling, all at very nice price. It matches up well against Epson’s R1900, which should ship around the same time. Epson’s focus on glossy prints is a definite advantage; since it lacks the R1900’s gloss optimizer, the B8850 will still exhibit some gloss differential on many glossy paper types. With the added gray ink, however, HP should have an edge for photographers looking to produce black-and-white prints, especially on matte and fine art papers. Both of these printers will also do a good job of competing with some of the B-size dye-based inkjets that are priced under $500, including Epson’s $400 Stylus Photo 1400 ( ) and Canon’s $500 Pixma Pro9000. We have been testing a B8850 for a few days now, and hope to have a quick first look up later this week.